Sugar Pea (Suggy)……December 24, 2016, A Celebration of a Bigger than Life Dog, Full of Joy…She was the air that filled the Balloon. We think Suggy was born in 2010. She came to us when we picked her up in Kentucky where she had been found. She was very young, not fed well for a puppy, and appeared to have had injuries. X-rays since have shown some damage was done in the spine and pelvis, and it looks like she healed herself. She also had a heart condition. Suggy was small for her breed with fine features. 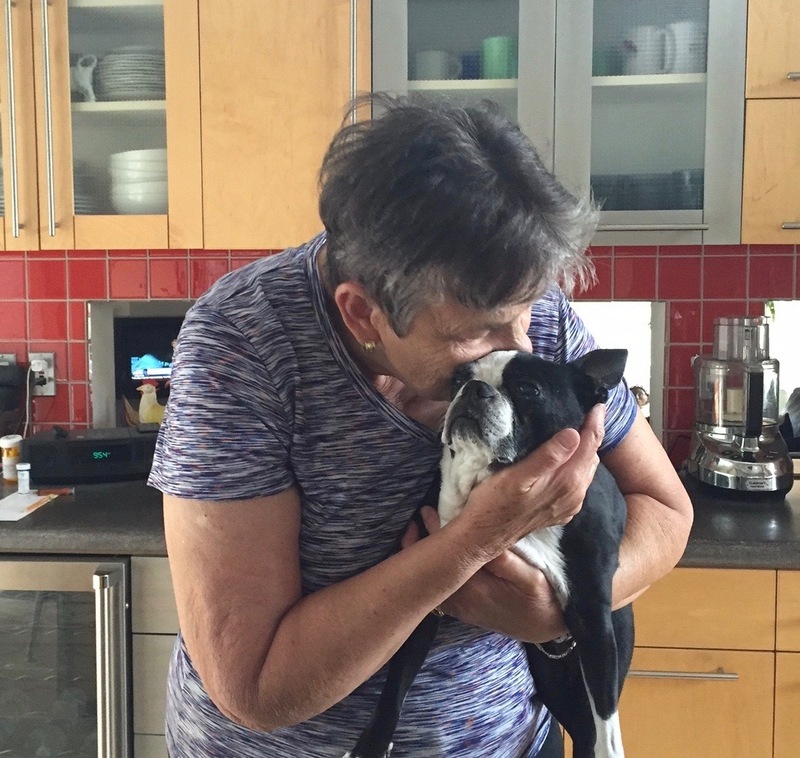 When we first saw her, we did not know she was a Boston Terrier because she was so malnourished, afraid, and grayish, crawling along the ground to greet us. We brought her back to Colorado and she became the love and joy of our lives. Whatever her injuries were when she was young, followed her into adulthood. Up until several months ago like the photo above, she was well and happy. Then, something took her brain. We loved her to the very end until it was time to let go, which was today December 24, 2016. I never had a small dog before, and she went everywhere I went like a little shadow. She sat in my lap when I worked at the computer. She sat at my feet when I was eating dinner, and she was always in my arms when watching TV and of course on the bed. We were inseparable. Her need to be close to me grew on me. She was my buddy. I loved having her so close. I want to take the opportunity to comment on life and how fragile it is. I go back to my roots as a child and look at life as inseparable from Good…only tangible to those who know its worth and practice making it real for themselves and others. That is what Suggy did. She filled the room with her presence. One could not resist to touch her. Suggy is forever in our hearts and my beloved Apolo Peruvian Horse will greet her at the Rainbow Bridge! We have so much appreciated the chance to love and know this little dog for such a short time. Bye My Love!